I love the book “Rework” by Jason Fried and David Heinemeier Hansson. I picked up a copy of this book while I was traveling to Chicago, about two years ago. Sitting on the bookshelf at the book store in the airport, it just jumped out at me. I decided to take a chance on it and buy a copy. I’m glad that I did. In case you aren’t familiar with the authors, David and Jason are founders of 37 Signals, a software company with millions of customers. They are also VERY popular bloggers. They have a huge following online and the guys are really savvy entrepreneurs. What I want to do in this post is share twenty of my favorite quotes from the book and also provide a book review. In the first section I will share my twenty favorite quotes from the book (in bold and italics) and then I will provide my thoughts on each quote. After I list the quotes, I will provide a book review. Let’s get started. Let me start this section by telling you that my copy of the book Rework is jam packed with highlighted and underlined quotes. I’d bet I have somewhere between 300 and 500 passages underlined, maybe more. That’s a lot considering the book is just 279 pages. There is so much wisdom in this book that would benefit any entrepreneur. The quotes below are my favorites. Enjoy. # 1 Too much time in academia can actually do you harm. My Take: College does NOT teach you how to start, run or grow a successful business. Instead, it teaches you how to be an employee. Just because someone has an MBA does not mean they know how to start or run a successful business. Some of the most successful business people in the world don’t even have a college degree. If you’re struggling in your business, DO NOT think that getting a degree will help you succeed. # 2 Getting back to people quickly is probably the most important thing you can do when it comes to customer service. My Take: When people ask you questions or have concerns with your business, address the issues immediately. Be prompt and answer all questions or complaints within 24 hours, or less. The sooner you can follow up with people, the better. # 3 The ability to change course is one of the big advantages of being small. My Take: When you have a small business you don’t have a Board of Directors or a panel to run decisions by. You can make your own decisions and make changes whenever you need to. That is a HUGE advantage that big businesses don’t have. # 4 Talk to customers the way you would talk to friends. My Take: Treat your customers VERY well. Treat them like they are a family member or a close friend and they will be very loyal to you and your business. People do not want to be a number. Get to know your customers on a personal level. # 5 Take the dream of overnight success for the slow, measured growth. My Take: There is no such thing as get rich quick in business, not legally anyway. What you want is nice steady growth year after year. Businesses take time to build. You need a plan and a little bit of patience. Most businesses take a few years just to make a profit and five to ten years to become established. # 6 Emulate drug dealers. Make your product so good, so addictive, so “can’t miss” that giving customers a small free taste makes them come back with cash in hand. My Take: This is really a good lesson. Create products and services that people just have to have and can’t live without. Give away lots of samples. If your product is good, it will sell itself. The world does not need more crappy products. People are looking for exceptional products worth talking about. # 7 Teach and you’ll form a bond you just don’t get from traditional marketing tactics. My Take: Focus on educating and helping your customers. Share blog posts. Create videos. Give instructions on how to do things. This is sometimes known as attraction marketing or selling by educating. It works wonders. And it’s much more effective than just spending money on advertising. # 8 All companies have customers. Lucky companies have fans. But the most fortunate companies have audiences. My Take: Build an audience and the money will follow. You want people that LOVE your company and are loyal fans and followers. That takes time to do. But if you have an audience, you will make a lot more money than if you just have customers. When you have an audience you can recommend any product or service and make money. # 9 The enthusiasm you have for a new idea is not an accurate indicator of its true worth. My Take: Just because you are excited about your ideas does not mean other people will be excited about them. Like dating, enthusiasm fades. What might be exciting today might be a nightmare in a few weeks or a few months. It’s not your enthusiasm that matters. It’s your customers’ enthusiasm that matters most. # 10 A lot of times it’s better to be a quitter than a hero. My Take: If your business is failing, and you can’t turn it around, it’s often much better to shut it down and move on to something else than it is to keep beating a dead horse to death. # 11 If you aren’t motivated by what you are working on it won’t be very good. My Take: Do something that you love. When you love what you do you won’t work a day in your life. If you are only chasing the dollar, you won’t do very well in business. # 12 It’s easy to put your head down and just work on what you think needs to be done. It’s a lot harder to pull your head up and ask why. My Take: Working harder is not always the answer. At times, you need to be able to step back from the situation at hand and look at your business from the outside in. Don’t be so busy working in your business that you forget to work on your business. # 13 The core of your business should be built around things that won’t change. Things that people are going to want today and ten years from now. My Take: Make sure your core products and services are not a FAD. You want products and services that will always be in demand. You can always add additional products and services, but make sure your core products will always be in demand. # 14 Limited resources force you to make do with what you’ve got. My Take: Having lots of money in your business is not normally a good thing. When you have a lot of money you can act like the government and just throw money at things hoping that money will solve the problem. When you don’t have any money, you are forced to be creative and resourceful and think outside of the box. # 15 There’s always enough time if you spend it right. My Take: We all have the same amount of time in a day. Most of us are not disciplined, nor do we spend our time wisely. However, there is always time to focus on the most important things. In business, the most important things are lead generation, making sales, following up with people and providing customer service. # 16 The easiest, most straightforward way to create a great product or service is to make something you want to use. My Take: Create products that people want. Create products that are exceptional and get people talking. Think about how companies like Starbucks and Apple have products that people talk about, and keep coming back for more. People don’t buy what they need. They buy what they want. Never forget that. # 17 Anyone who runs a business that is sustainable and profitable, whether it’s big or small, should be proud. My Take: Building a profitable business is hard to do. It’s said that nine out of ten businesses fail in the first five years. If you have a profitable business that has survived even a few years, you should be very proud of your accomplishments. # 18 Decide what you’re going to do this week, not this year. My Take: Have a one year plan for your business, but focus most of your efforts on what can you do right now to make money and grow your business. What you do right now will determine if your business is still around in another year. # 19 Unless you’re a fortune teller, long-term business planning is a fantasy. My Take: It’s great to have a one-year, five-year and ten-year plan, but we all know that most businesses don’t last that long. What matters most is short-term planning. What can you do today to grow your business? What can you do this week and this month to make more money in your business? # 20 In the real world, you can’t attract millions of customers without any salespeople or advertising. My Take: Even if you have an excellent product or service you need to invest some time and money in advertising and marketing. You need to get the word out there so people know what you have to offer. Having an exceptional product or service is mandatory, but it’s just the starting point. You can’t just open up shop and expect people to flock to your business. Rework is an amazing book. I give it 10 out 10 stars and rank it as one of my top 20 favorite business books of all time. What I like most about the book is that it is to the point and really easy to follow. The authors have a great writing style and they have the knowledge and wisdom to boot. If you’re looking for some practical and effective business advice to take your business to the next level, this is the book for you. 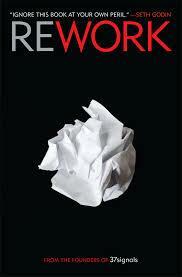 Rework is written by Jason Fried and David Heinemeier Hansson, founders of 37 Signals. It is published by Crown Business. The book comes in hardcover format and Kindle version. It retails for $22 in the U.S., but you can get a better deal if you shop around. It is available anywhere books are sold. It features 279 pages. In summary, I hope you’ve enjoyed my top 20 Jason Fried and David Heinemeier Hansson quotes and book review of the book Rework. I really consider this a must read for any small business owner or aspiring entrepreneur. It’s a fun read and full of Golden Nuggets. If you’ve read the book before I would love if you left a comment below and told us what you think about it. I look forward to hearing from you. I’m aware of 37 Signals and have used one of their products, ‘ta-da-list’. Judging by the quotes you shared and the creators, the book seems to be full of wisdom and one that’s worth reading. My favorite quotes are #5 and #20, spot on. #2 is also an excellent tip to always keep in mind. Thanks for sharing. The first point is so pertinent. College definitely teaches you to be an employee; not how to branch out on your own. I found it kind of challenging when I first went into MLM to switch from that employee mentality to a business owner mentality. I wasn’t groomed for it and really had to do research and find a mentor to help me make the adjustment. Certainly not knocking college because I am grateful for the experience and what I learned, but had I known then I was going into MLM I might have gone a different route. I’m not against college either. I just think it isn’t a good fit for everyone, and even for certain professions. Lots of professions don’t require a degree. It really depends on what you want to achieve. This sounds like a great piece of reading. I am going to check the library to see if they have it. If not, I will order a copy. I love how they are down to earth and provide the information in an easy to understand format. I also like how they stress short term goals instead of long term. The part about being a fortune teller is so correct. While it is good to have long term goals, the short term goals are what creates success. Yes, this does sound like a great book. Do you know if it is in Kindle or ebook format? Thanks for this great review. I really, really love this book. Yes, you can get in in Kindle format. There are tons of great nuggets in it.